For those of you who don’t remember, I chose not to purchase any books this year. Free books, of course, didn’t count. I made one exception, but other than using gift cards I received for Christmas and my Birthday, and getting books from the Boyfriend as a prescription against insanity, I didn’t buy a single book. Not spending my own money on books took some creativity on my part and generosity on the part of others, but I can at least say I was successful. I also succeeded in reading at least 51 books that were already on my shelves…or in boxes…in a storage unit. Yeah, lots of books, itty bitty living space. There, my friends, is where I flailed. You see, despite not buying books with my own money, I still managed to bring a lot of books home with me this year. In fact, I have less space on my bookshelves than I did before the challenge started, and that’s after taking several boxes of books to the used bookstore to earn enough money to buy the Outlandish Companion, Vol. Two. I earned that book, darn it, so why isn’t there any space on my shelves?! Well, between the Boyfriend showing he loves me through books, a couple of subscription boxes I get, and all the giveaways I’ve won this year, I not only replaced the books I sold but ended up filling every last nook and cranny of my bookcase. I have so many books and so little space for them that when the Boyfriend asked me what I wanted for my graduation present, I told him, “NO BOOKS!” I then checked myself for a fever because that is the first time in my life I’ve ever turned down the opportunity to get books. It turns out this challenge has been a sort of 12-Step program for me. So, I plan on participating again next year, but that’s for another post. This month, those of us participating in the #ShelfLove No Book Buying Challenge are discussing whether or not we’re thankful for taking on the challenge and whether or not our book buying and reading habits have changed. I came up with several ways to get books for free, and I started listening to serial and short story podcasts. I’ve fallen in love with audiobooks thanks to discovering the free audiobook website, podiobooks.com. I became much more discerning about the books I purchased with the gift cards I received for Christmas and my Birthday. The same goes for the books I chose when the Boyfriend made an agreement with me to help me survive the Spring semester. I finally got my Goodreads shelves updated, created a spreadsheet of all my unread books, and made TBR jars. I cleared out enough books from my collection to earn enough money to buy the one book I had been looking forward to for most of the year. I’m finally ok with not buying books. I’ve also come to prefer book-related gifts instead of bookstore gift cards. Why? I own more books than can fit on my shelves. Despite all the books I took to the used bookstore, my shelves are no less stuffed than they were at the beginning of the year. In fact, I have even more books thanks to the Boyfriend, gift cards, and winning giveaways. This month, those of us participating in the #ShelfLove No Book Buying Challenge are discussing how we organize our books. Dresden likes to keep one of his toy mice on top of the boxes for safe keeping. I have too many books to keep in the apartment I share with the Boyfriend. Because both of us have large personal libraries, but only so many walls to place bookshelves against, most of my books are in boxes in storage. Only two of my book boxes are in the apartment instead of my storage unit. They hold my Harry Potter books as well as all my books from Anne Rice’s “Vampire Chronicles” and the “Lives of the Mayfair Witches.” Since I’m re-reading all those, I decided to keep them at home rather than having to go to my storage unit every time I finish one of the books. There are several other books in the boxes as well, but I simply don’t have space on my shelves. With a few exceptions, all the books on my shelves are books I’ve never read. 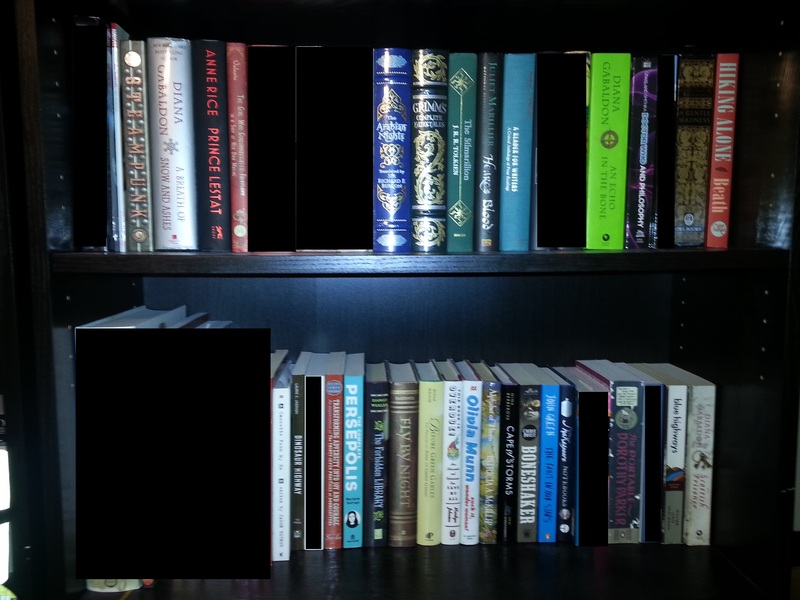 Also, I have them organized by height and from hardcover to mass market paperback. 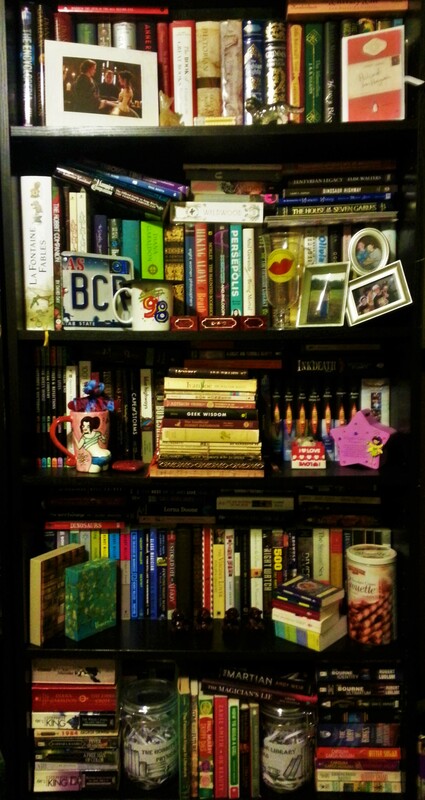 The disadvantage to organizing them that way is that, whenever I get a new book, I have to rearrange the shelves. You might think I would also have the problem of finding specific titles, but there is a large part of my brain dedicated to the books I have and where they are at any given time. 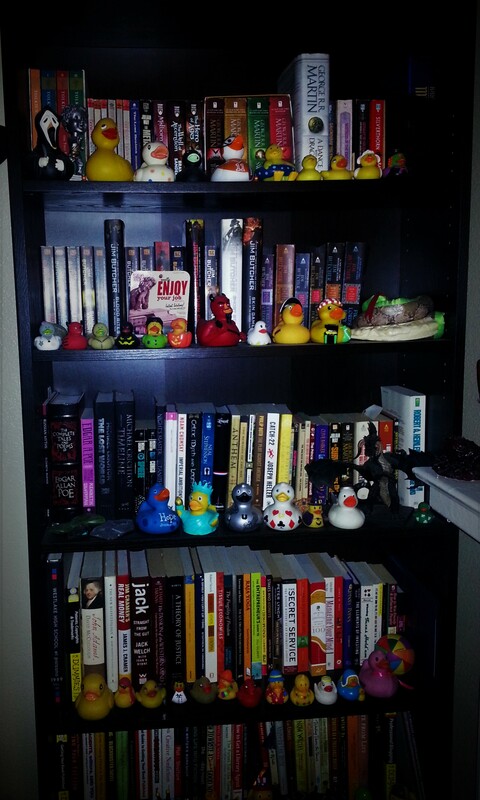 One of the Boyfriend’s bookcases post-organization. Can you tell he likes ducks? After our trial period of living under the same roof assured us that we could share living space without committing double homicide, I convinced him to let me organize his books. The closest he got to being organized was having all of his Jim Butcher books on one shelf. He culled books to go to the used bookstore while I began grouping the ones he decided to keep into genres, more or less. I also kept any series together and in order, and then I organized by height whenever possible. Since we’re both writers with decent sized collections of reference books, we decided to combine them on one shelf with a bookend in between. We’re just not at the point in our relationship where we feel comfortable completely integrating our libraries. Right now, it’s enough to know that we have similar tastes and many of the same books in our separate collections. 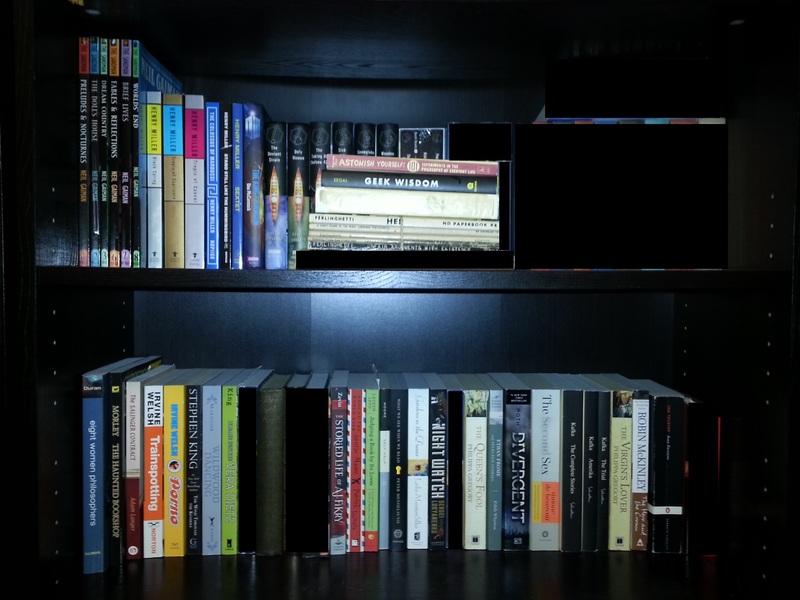 Six months down, six more to go for the #ShelfLove No Book Buying Challenge, and I swear I haven’t gone insane….yet. Actually, these first six months have been easy for me; at least until the Spring semester ended, and I was no longer getting a paperback of my choice from the Boyfriend every week. As many of you know, the Boyfriend made a deal with me that I would get a new book every week I completed all of my assigned writing. It was a way to both motivate me and keep me from having a nervous breakdown, and it worked. I didn’t realize just how much those weekly trips to the bookstore had helped me until they were gone. A trip to the library resulted in me lugging home seven books, which helped. However, the problem is that I tend to pick books that I then want to buy, so my wishlist is only growing. I also realized that I truly do have a book buying habit. I’d call it an addiction, but so far I haven’t spent any money on books to get that “fix”. However, I’ve used all my gift cards, I choose the slowest shipping option when I buy anything on Amazon to get the $1 credits, and I frequently “1-click” free ebooks. I also compiled a huge list of sites for free books. Because of this, my digital library has expanded exponentially, and I’ve listened to quite a few audiobooks, all for the low, low price of free. I’m ok with that though since those books aren’t taking up space on my shelves or in my storage unit. Speaking of my physical books, I removed an entire box worth of books from my life and sent them to the used bookstore. I’m trying to earn the money to buy The Outlandish Companion, Vol. 2 by Diana Gabaldon. I got $21.67, and I’m putting together another box from books that have been sitting in storage for years, thanks to moving at least once a year and living in increasingly smaller apartments or overseas. My apartment is bigger now, but I’m sharing it with the Boyfriend and both of us have the problem of not having enough shelving or the wall space to add more. If it were just me, I’d get rid of the couch and replace it with two shelves, but that’s not the case, and it’s not my couch. So, instead, I’m participating in this challenge. So far, I plan on participating again next year, but I already know I’ll do things a bit differently. I’ll have graduated from college and should have a decent paying adult job by then. So, I’ll set some goals for myself to “earn” money, including activities such as finishing physical books and exercising. Until then, I’m going to continue doing what I’ve been doing and hopefully won’t end up in a straight jacket. This month’s #ShelfLove topic is all about how well we’re sticking to our goals and what we’re doing to refrain from caving to the temptation of buying books. Honestly, I feel like I’ve got it pretty easy so far. The Boyfriend has been buying me one book of my choice, as long as it’s not a full-priced hardcover or new release, every week that I get all of that week’s writing finished for my research papers. Not only is the agreement motivational, but it’s keeping me sane. It’s also making this No Book Buying Challenge a breeze. So, check back with me around mid-May, when I’m not getting a book every week. Besides the Boyfriend’s amazing gift of books, I’ve been making do with the books I already own but have never read, as well as the books I get through Netgalley, and I just recently used up the last of my gift cards. I’ve also done quite a bit of “buying” and downloading of free books offered around through so many different websites besides the major book sellers, and checking out the occasional book that grabs my attention from the library. Other than that, I don’t have any special strategy, which is why I’m a little worried about what I’m going to do when the semester is over and the Boyfriend is no longer enabling my habit. The problem is that I’m addicted to bookstores, and not just to books. Bookstores, with their mostly quiet and peaceful atmospheres and organized shelves, calm me down, but I have difficulty leaving them without buying at least one book. Even when I lived in South Korea, I would find something to read in the smallest of sections dedicated to books in English. It doesn’t matter if I’m also buying a magazine or something to eat or drink from the store’s cafe, I will come across a book that will call out to me and beg me to take it home. After this semester is over, if I want to make it through this challenge, I will have to stay away from bookstores, unless I have adult supervision. I have no idea how that will affect my mental health, but I plan on trying to mitigate any craziness by making frequent trips to the library, since it has a similar calming effect. It’s February, which means those of us participating in the No Book Buying Challenge are supposed to share their book budgets, or what the money saved from not buying books will be spent on. As you all know, my goal for this challenge is not to spend any money at all for the entire year, but gift cards and free books don’t count. I’ve spent most of the money on my gift cards, but I’m saving the rest for the new edition of The Outlandish Companion by Diana Gabaldon that comes out in March. I’m close to earning my 1st $5 Amazon gift card through one of the rewards programs, and I’ve also downloaded several free ebooks that I’ve come across. I’ve earned 2 books so far from the agreement with the Boyfriend. So, overall, I’m not feeling at all deprived for books. However, I do have to repeatedly tell myself when I’m at the bookstore that I don’t have to buy every book on my wishlist right now because they’ll still be there when I’ve earned them. I don’t know where that sense of urgency comes from, but I do know that my self-discipline and willpower are growing 🙂 I’ve read 5 books off of my TBR shelves towards my goal of 50, which means that if I’m able to keep that up, I’ll have met my goal by November. I don’t have any plans for the money I’m saving from not buying books, but I will be taking the books I’ve read and decided not to keep to Half Price Books at the end of the year. The money I get will go towards my book budget for 2016. By then, I should have my degree and hopefully an adult job, but I want to continue spending as little or no money on books until I’ve got free space on my shelves.